3 Mill Street, Rutherglen, Glasgow. G73 5HD.Tel: 01416473007. 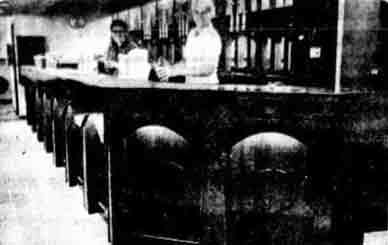 Barmaid Isobel McElhinney and Mrs Elizabeth Craig, wife of the manager, have a “trial run” before the opening of the Cathkin Inn. 1978. It’s always a bit of a blow for regulars when their pub has to close and they are left without a friendly howff. But that’s what happened to the customers of the old Cathkin Inn in Mill Street, Rutherglen, when it closed because of redevelopment seven years ago. But the good news is the Cathkin Inn lives again. Yesterday, Tennent Caledonian Breweries opened a new Cathkin Inn on almost the same spot as the old pub. Manager of the new Cathkin Inn is Mr Robert Craig, who is confident that the Cathkin can win back all its old regulars. There is a lounge and public bar within the premises and both have been attractively laid out. The lounge bar has been designed in the style of Charles Rennie Mackintosh, the main colours being black and red. In the public bar the prominent colour is orange. There is also some beautiful dark wood panelling in the gantry. Mr Craig plans to serve bar snacks in the Inn at lunchtime and if there is a demand for it in the evening also. Although there is no live music, the Inn has a juke box both in the lounge and the public bar and some one arm bandits. The public bar also has a colour television. Mr Craig, who is from Blantyre, has over 12 years experience in the licensed trade. “The Inn is ideal for a couple looking for a quiet night out or a man going out for a drink with his mates. The interior is very comfortable and the Inn itself is in a very good spot,” he said. And with four full-time staff and part-timers too, Mr Craig can promise customers a quick and efficient service.